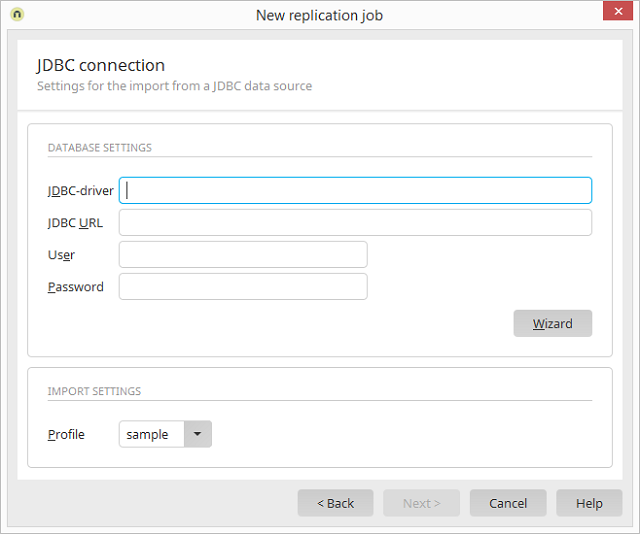 Users module User menu / User and group import Replication source / Add Select JDBC / Click on "Next"
Enter the required driver here. Enter the connection URL here. Enter the username and password required for logging in to the JDBC source. Opens a wizard that will help you configure the source. Profiles will be saved as XML files in the installation directory intrexx/cfg/omjdbcrplconfig. You will also find the file sample.xml there, which has been created as an example profile for importing an Intrexx user management. You can use this file as a template for your import and change it as necessary. Please download the appropriate JDBC driver for your database management system from the manufacturer.